One of the most anticipated events of the year is upon us as Penn Manor’s spring musical draws its curtains. Starting Thursday, March 11, Penn Manor will host their annual show to the community at 7:30 p.m. This year’s musical is a reproduction of the recent Broadway musical, Curtains. Just two and a half years after it debuted on Broadway, Penn Manor will become the first High School in Lancaster County to reproduce this young musical. The show is a “show within a show,” set in 1950s Boston. It is centered on a Broadway-bound musical with hopes of making it big, until their leading female role is mysteriously murdered. 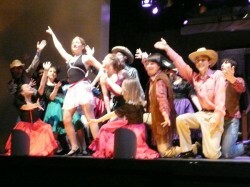 The cast attempts to balance solving the murderer with preparing their own show in this musical-comedy. For those who may be skeptical about going to see a musical, there seems to be a general agreement that Curtains has more to offer than simply song and dance. Tickets are on sale this week in the cafeteria during all lunches for shows on Thursday, Friday, and Saturday at 7:30 p.m. and a 2:00 p.m. matinee on Saturday. Tickets are $5 for students and $7 for adults at lunches and increase a dollar in price at the door. All seats are reserved, so it is advised to buy tickets for groups at one time. You really missed out if you didnt come see it! Congratulations to all students involved in Curtains. It was an excellent production and I thoroughly enjoyed the show! 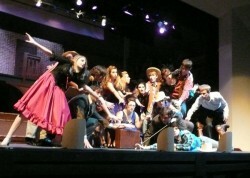 We have enormously talented actors, actresses, musicians and singers at Penn Manor. The show was wonderful!